To overcome this precipitation, competing products employ a chelate of ferric iron: iron-EDTA. While this does keep it soluble, it has a couple of drawbacks with respect to foliar uptake of iron. (1) Iron-EDTA bonding is very strong, thus very little of the iron will be available to the plants over a given time frame and (2) Physiological energy must be expended by the plant in order to extract the ferric iron from EDTA-iron and then convert (reduce) it to the ferrous form. Our approach is different in that we use a complex (not chelate) of ferrous iron in Pond Flourish Iron™. 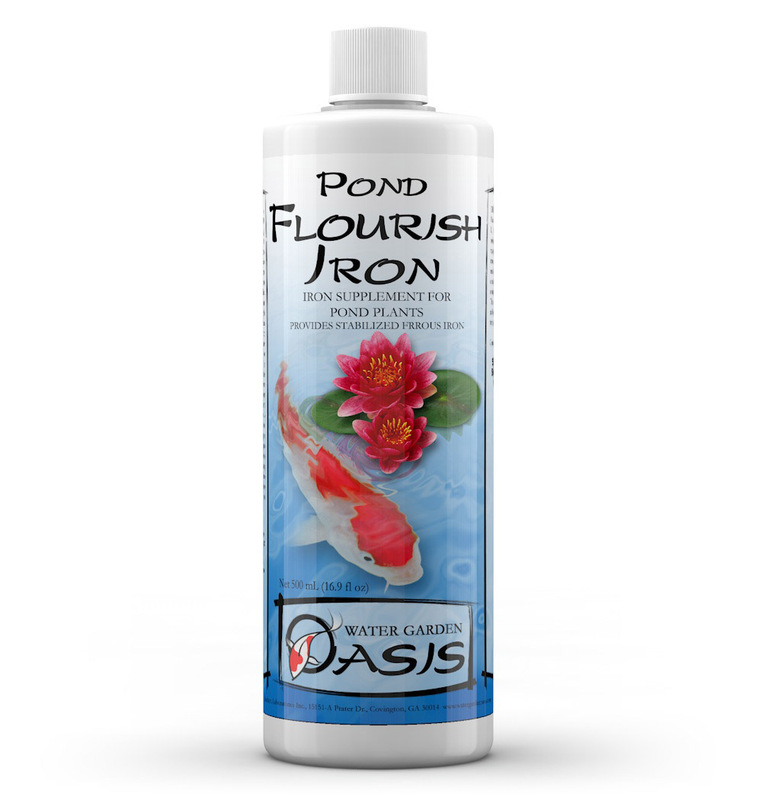 Pond Flourish Iron™ is a highly concentrated (10,000 mg/L) ferrous iron gluconate supplement. Plants are able to much more easily derive a beneﬁt from Pond Flourish Iron™ because ferrous iron gluconate is already in the ferrous form so they do not expend energy reducing it. Despite what other manufacturers may intimate, gluconate is not harmful to plants or fish. In fact, ferrous gluconate is better suited to foliar feeding than is iron-EDTA owing to the relatively weaker iron-gluconate bonding vs. iron-EDTA bonding. In addition, ferrous gluconate has the added bonus of being a source of carbon. Use 1 tablespoon per 100 gallons once or twice a week as required to maintain about 0.1 mg/L iron. Use MultiTest™: Iron test kit to monitor iron concentrations. Use only in a contained pond as directed. This product is not intended for natural bodies of water or agricultural use. There are no questions for Pond Flourish Iron™ Ask us a new question.